Kings creek Country Club Homes in Rehoboth Beach, Delaware have breathtaking golf course views, with Rehoboth Bay in the background, will delight & surprise you in this elegant custom golf course home. Formal & informal living spaces; 1st & 2nd floor master suites; spacious deck taking advantage of expansive views of 3 holes; furn. & club membership negotiable. If you are ready to discover what living the good life really means, Kings Creek Country Club homes in Rehoboth Beach are worthy of your close consideration. Imagine living among 350 quiet acres of rolling hills, woods, wetlands, and waterways, with Rehoboth Bay as your scenic backdrop. Let’s not forget to mention that Kings Creek luxury properties claim Delmarva’s best 18 hole championship golf, similar to courses only seen in the Carolinas. The course itself offers challenging play for golfers of all skill levels, and is carefully designed to complement the gentle hillsides and natural beauty of the area. Kings Creek Country Club homes were built according to exacting architectural design standards, and buying a home in Kings Creek will be the realization of your dream to live in a serene country club setting. Kings Creek homes are situated on the Delmarva Peninsula, and within 150 miles of every Mid-Atlantic metropolitan area. The club itself offers a number of amenities its members, including a Junior Golf program, year round practice facilities, chipping areas, putting green, and the Learning Center. There are tennis camps, a baby pool and adult swims every hour. 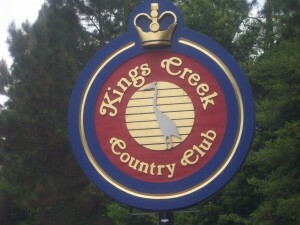 Own property in Kings Creek Country Club and you will enjoy an active lifestyle. Kings Creek homes are decidedly luxury in nature, with prices ranges from the 500’s to mid 1M, and amenities that include gourmet kitchens, cherry cabinets, walk-in storage above garages, mahogany floors, granite countertops, sunrooms, stone fireplaces, plus plenty of square footage and yard space. Call today for more information on these fine Rehoboth Beach golf course homes.